A few years ago a handful of editorials in South Korea's leading newspaper greeted the global spread of this Japanese barbecue (aka yakiniku) chain with admiration for its formidable marketing assault, along with a touch of disgruntlement. For centuries Korea has profoundly influenced Japanese culture, but it gets little credit for it. Gyu-Kaku's successful repackaging and rebranding of the elemental Korean barbecue experience—even going so far as to rename varieties of kimchi—seemed to sting a bit. After all, why couldn't Koreans take the brawny pleasures of cooking marinated meats over open flame and launch an 800-outlet chain themselves? It's a mystery to me too. Chicago already has a strongly Korean yakiniku in Albany Park's Chicago Kalbi. If you've sat at a tabletop grill there, you know the meats are of a slightly higher quality than at the average mom-and-pop Korean barbecue joint (it is in fact Korean and Japanese owned). But they're doled out in smaller quantities, the panchan are less numerous and varied, and there are small but annoying upcharges for rice and a few leaves of lettuce with which to deliver dainty bits of charred flesh to your mouth. If you're going to pay to cook your own food, the least you should expect is an unlimited array of side dishes, grains, and greens to sustain yourself amid the heat and smoke. Gyu-Kaku ("bull's horn") takes this nickel-and-diming to vexing lengths. The Chicago entry is the 13th U.S. incursion of the franchise, with pairs in Hawaii and New York but most in southern California. As you're led in among the semi-isolated tables inset with roaring gas-powered grills, line cooks in the rear open kitchen bellow the traditional welcome, "Irasshaimase!" Servers issue precise instructions for grill placement and cooking times (fillet cooks for a mere 15 seconds a side; intestine needs to be charred for a good minute and a half). But first you'll be asked to choose some apps, among them small plates of simple cucumber, daikon, or cabbage kimchi priced at an astonishing $4 apiece. (The growing practice of charging a la carte prices for kimchi must stop.) Apart from those and a hilariously unworkable deck of dried seaweed squares meant to be schmeared with cream cheese like the saddest bagel in the world, more reasonably valued starters include a handful of salads and soups and some slabs of soy-and-ginger-sauced fresh salmon sashimi, parcooked with a drizzle of scalding hot oil. The main event is supplied by an extensive beefcentric selection, very fresh, and certainly more varied and specialized than that at a typical Korean joint, ranging from higher-end Kobe options and chateaubriand to gnarlier, cheaper cuts such as brisket and ribs. Wild cards like lamb chops, pork jowl, duck, shrimp, scallops, tuna, Kurobuta weenies, and a few odd bits (tongue seems be a popular order) provide balance. Each and every one is bafflingly customizable with one of five different marinades (white or sweet soy, miso, garlic, or basil), which might explain why orders take so remarkably long to arrive from a kitchen that doesn't have to cook them. You taste salt, you taste sweet, you taste herbal—it doesn't get more complicated than that. Vegetables play a supplementary role—foil packets of, say, garlic cloves and sweet potato or unseasoned broccoli florets, corncob sections, and shisito peppers meant to be thrown naked on the flame are priced in the same $3-$6 ballpark. Most outrageously, a handful of red lettuce leaves runs $3, and a small portion of steamed rice—an essential and usually gratis accompaniment to any Korean meal—is $2. Servers will recommend two meats (in 3.5-ounce servings) and one vegetable per diner—and modern nutritional wisdom might tell you that's plenty of protein. But even going beyond this isn't likely to leave one very satisfied. A selection of rice and noodle dishes meant to be eaten at the end of the meal can help fill the empty space; these include an opaque but inadequately porky shio ramen, garlicky "Okinawan" noodles that seemed house-made (I was told they weren't), and spicy-good "sukiyaki" bi bim bop mixed tableside by servers, who spread it around inside the searing hot bowl to impart a crispy texture to the mix. 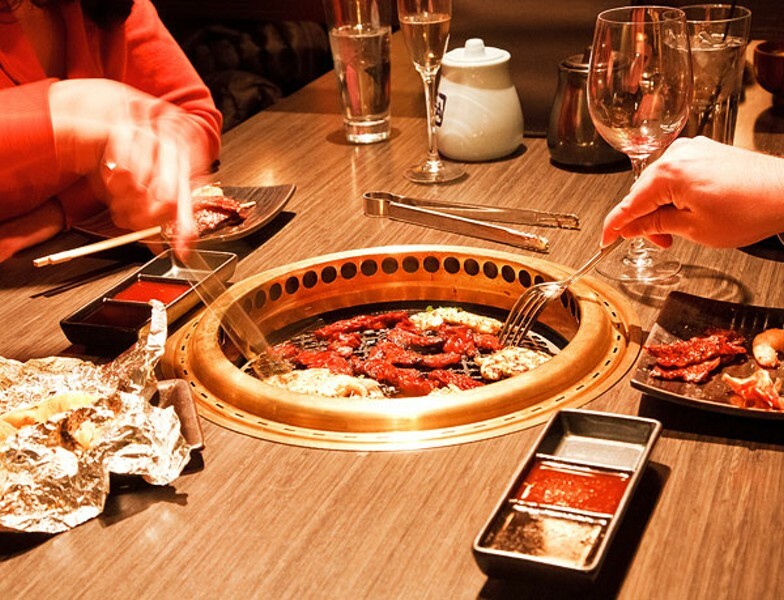 Gyu-Kaku could set an awful standard for Korean food for unsuspecting millions. The history of successful corporate bastardizations of ethnic cuisnes—from Taco Bell to Olive Garden—is long and ignoble, and this one is no different. Yet I can see its attraction. It's a lively, hip environment, though some oddities might knock you off balance—mouthwash and toothpicks are offered within splashing distance of the hand soap, and there's a constellation of security camera bubbles positioned among the smoke alarms and exhaust system (don't try to steal the chopsticks). Further, that vacuum is powerful enough that you're not likely to smell like a well-done side of beef afterward, and happy-hour specials, text-message coupons, and a rewards program keep the place hopping. But for all that, this remains culturally appropriated Korean barbecue lite.